Today! 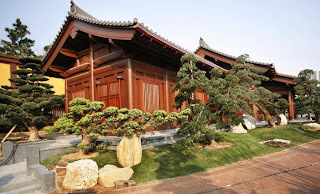 I would like to introduce Timber Architectures, In ancient China, architectures can generally be categorized into “ting” (pavilion), “tai (terrace), “lou” (tower or house), “ge” (pavilion or tower), “xie” (house), “”xuan” (hall or house), “zhai” (study). There is “guan” (house or hall) and there are “lang” (verandahs) and “wu” (enclosed verandah). Generally speaking, a ting is an individual structure for people to have a short stay. When it is enclosed it becomes a Ge. may also be more than one storey. a terrace is a mound or a solid platform above the ground on which structures may be built. A lou is usually a multi-storeyed structure. It is not easy to distinguish a xie a xuan a zhai or a guan, however. They may be an individual structure or a group of structures in a complex. The usage may vary. They can be a place for people to read, to paint, to have tea, to entertain or to confer. There are no strict rules for their categorization and they are usually determined in accordance with people’s preferences. Traditional Buildings in China were mostly constructed of natural materials such as clay, stone, and in particular, timber. 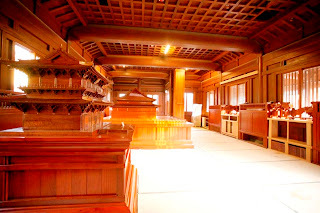 Noted for its easy-to-work nature and structural flexibility, timber has been utilized to develop a unique style of architecture that is distinctively Chinese. Growing out of the earth, timber is symbolic of life and growth. It is exactly this symbolic meaning tha Chinese architecture embodies. Timber adds life to the monastic hall and evokes a feeling of harmony and unity with the cosmos. The tiled and gabled roof provides easy drainage for rain and snow, and the drip tiles of protruding eaves serve both practical and decorative functions. The other parts of the roof and the ridge can also be decorated with various kinds of ornament. Next time, would like to introduce how to build and the speical structure - the Bracket System. Meanwhile send my regard to Mata and all of us , let's never give up! I apologize for my long time absence but I am not very good. Actually I’m very in a badly situation. My psychologically problems are still exists. Times to times I visit our site, but I can’t think anything to write. I think I loose my mind sometimes. I have lost a lot of weight and my smile. I think that I’m lonely in this world. I want to leave permanently, far away from all, sometimes I want to die. 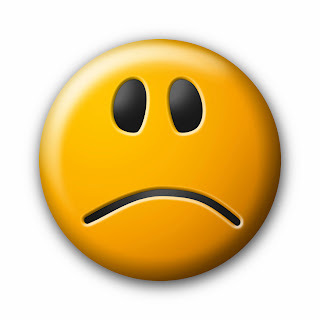 I know that it’s terrible to say that bur I feel like this. I own to you writing assistant about an artist, but I can study for him now. I miss you all I really mean this. But for now I have to find myself. I have to find the old matoula. I hope all you are well. Sorry about this but I feel you my friends and I want to speak to a friend. I hope back to you again soon. Take care, all of you! Hello! Everybody let us continues the tour. Passing the Lands and Seas, Visitors come to a gentle uphill path and the West Hill is borders the flyover highways on the west. Evergreen plants on the hill include Chinese Mahonia, Luohan Pines, Indian Canna and others. The hill, plants and sound-proof barriers have the function of blocking out outside scenes and maintaining tranquility of the Garden. End of the path the Chinese Timber Architecture Gallery in Tang designed is located there, here have some of the most representative examples of fine timber structures in China still in existence today. These include the pavilion, terrace, tower, verandah, hall and study room. They represent different types of traditional architectures in ancient China.Remind guests that photography is not allowed inside. 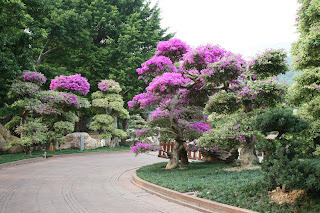 Next time we will introduce the traditional architectures in ancient China for review. Good luck! See you soon.